Lockheed Martin‘s Sikorsky subsidiary has announced plans to offer depot-level maintenance and flight training services for Black Hawk customers in Latin America through facilities located in Colombia. Sikorsky intends to extend support services that Colombian armed forces and national police currently receive from the subsidiary to other clients across Argentina, Brazil, Chile and Mexico, Lockheed said Tuesday. 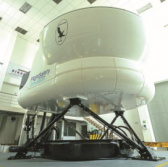 A Melgar-based center houses a five-axis Black Hawk simulator while a Tolemaida-based repair site employs 30 mechanics and engineers trained to fix airframe structures. Forty-six Colombian citizens work at those facilities that four other countries will now have access to, Lockheed noted. Sikorsky expects Latin America’s Black Hawk fleet to grow with the scheduled delivery of six S-70i units to the Chilean air force later this year.